Make your garden nothing short of a paradise with cutesy accessories, plants, and pots from The Garden Store in Jubilee Hills. They also undertake gifting and decoration for events. The aesthetics of this store are on point with vibrantly coloured pots and lots of green plants making you feel refreshed. If you seek to make your garden/lawn a work of art, you are at the right place. Here, you can buy pots of all shapes and sizes. 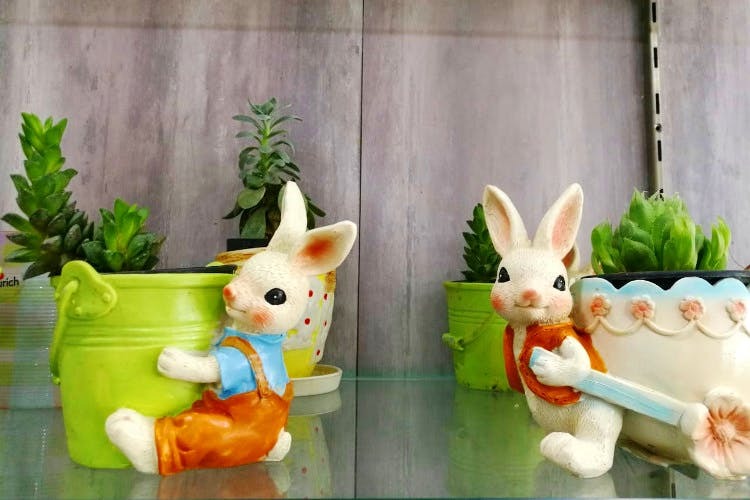 Get bunnies, frogs, squirrels, and dwarfs from Snow White to hold your plants, and find many more themed plants here in shapes like that of a bicycle or a garden well too. They have a collection of plastic rain pots (INR 120) and hanging pots too if your balcony needs one.Garden showpieces range from mushrooms and birdhouses to Buddha statues and water fountains. These quirky and attractive pieces make great gifts to give your gardening enthusiast of a friend. You can even get real plants, pebbles, and seeds. Everything you might need to take care of your plants like biostimulants and plant shampoos are also available. Among the plants for sale, we saw the lucky bamboo plants, succulents, peace lily, Boston fern and golden pathos to name a few.While here, don't forget to check out the range of German self-watering planters that this store houses. Starting at INR 18,000 — these water planters will keep your plant babies hydrated for about 60 days, and if you are someone who loves plants but loves to travel as well, you certainly need one of these. Although the staff is informative, we do wish they had updated their website with the necessary information to make purchases.